For Billups, Perkins and other African-Americans from Park Hill — which is a neighborhood, not a city — such pride is the norm. Perkins was born on Aug. 25, 1995, and primarily raised in what was then a predominantly black neighborhood in Denver’s Northeast quadrant. Park Hill has a notable list of African-Americans hailing from there, including Billups; actress Pam Grier; actor Don Cheadle; Earth, Wind & Fire singer Philip Bailey; former NBA All-Star Joe Barry Carroll; former NFL players LenDale White and Adrian Cooper; University of Denver men’s basketball coach Rodney Billups; budding star rapper Trev Rich; and late Colorado Secretary of State Victoria Buckley. A home in the Park Hill neighborhood features what Rebecca Rogers calls the “Park Hill porch,” an extension of the brick column above the porch roof as photographed on Nov. 18, 2015, in Denver. 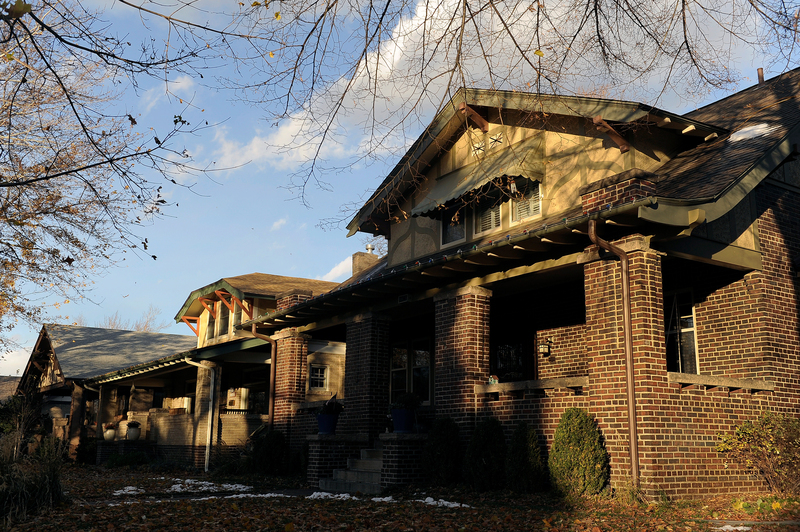 Rogers is leading an effort to get Park Hill designated as a historic landmark district. Perkins is currently the toast of Park Hill as a starter for the Bulldogs, who could win their first NCAA men’s basketball championship Monday night against North Carolina. Park Hill will be watching. “Anybody that is from there, we all know that there are not a lot of people that have made it big from Park Hill,” Billups said. “So when we have somebody who has or is in the process of doing well, we like to yell it out. We like to raise our hand and say, ‘Yeah, that’s me and I’m from Park Hill, by the way.’ It’s just a hometown pride thing. Long before Perkins was born, the arrival of blacks in Park Hill caused a racial divide. According to the Denver Library, Baron Allois Gullaume Engine von Winckler designed the original Park Hill development on 32 acres of his own land in Northeast Denver in 1887. As the neighborhood grew, settlers from England, Denmark, Germany, the Netherlands and Italy moved there, as middle-class African-Americans eventually did too. After World War II, middle-class African-Americans began purchasing homes closer to Park Hill, which was then almost exclusively white. Some real estate agents used the racial issues to their advantage as they pushed black families onto streets in Park Hill, causing unhappy white homeowners to sell. Prospective black homeowners also had trouble finding banks willing to lend them money for mortgages and real estate agents willing to sell on certain streets where whites lived. Park Hill native Metise Moore, an African-American who played college basketball at Akron, recalls some of the stories about race from his beloved neighborhood. “My mom used to talk about busing,” the 46-year-old Moore said. “A lot of black people lived in East Side Park Hill. They would bus them out to schools to spread them out to other schools, and there were problems. My mom said there was a riot in black shopping centers, Dahlia Square and Holly Square, in Park Hill when Martin Luther King was murdered. When Perkins was 5 years old, the U.S. Census report stated that Park Hill had 26,422 residents, of whom 51.4 percent were black, 39.7 percent were white and 17.2 percent were Hispanic. According to StatisticalAtlas.com, Park Hill is now 47.9 percent white, 32.4 percent black and 13.1 percent Hispanic. The Dazzling Diamonds perform during the seventh annual Park Hill Fourth of July Parade on July 4, 2016. Moore said the values of the Park Hill homes, including the one he lives in with his wife, Tina, “have gone up dramatically.” Moore added that the past gang and drug problems of the 1980s and 1990s aren’t as prevalent today. Moore and Billups believe the gentrification has been good for a diverse Park Hill. “That hasn’t been a problem racially, whites versus blacks. Most of the whites moving in grew up around a lot of minorities. They don’t have the same outlook as people our parents’ age had,” Moore said. Basketball played a primary role in Perkins falling in love with Park Hill. The sport has been played at Hiawatha Davis Jr. Recreation Center at a high level for decades, with Billups as the headliner. The 2004 NBA Finals MVP played in the Denver John Bailey Joint Effort Summer Pro-Am for years, and games were free for neighborhood children. While Billups’ team, Smooth’s Squad, was the one to beat, competition was always fierce and trash-talk-infused in the summer. The 2004 NBA champion had free summer basketball camps at the center that Perkins attended. Former Denver Nuggets star Carmelo Anthony also once hosted a free basketball camp there. 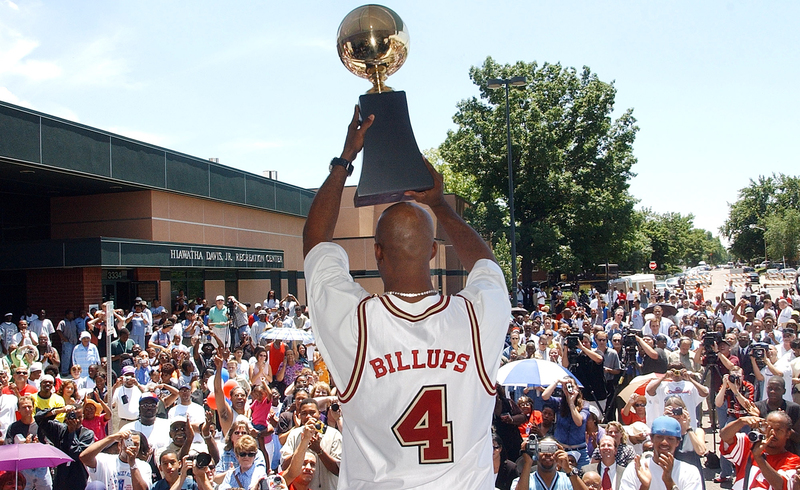 Denver native Chauncey Billups holds his MVP trophy for fans to see during a ceremony where he was honored in the Park Hill neighborhood of Denver on July 1, 2004. Billups, who led the Detroit Pistons to the NBA championships, grew up in the neighborhood. He played high school basketball at George Washington High School and went on to play at Colorado before being drafted into the NBA. Perkins said he learned a lot mentally about the game going to Hiawatha Davis and watching Billups, the occasional Nuggets player, and other former college stars play in the Pro-Am. Billups grew up idolizing and watching former NBA star and Denver native Micheal Ray Richardson, who often played pickup basketball in the summer in Denver. Billups, a star player at the University of Colorado and George Washington High in Denver, said it was important for him to also play in Park Hill in the summer so local kids like Perkins could touch him. “I could’ve easily during my NBA summers went to L.A., Atlanta or Miami and just had fun and enjoyed it,” Billups said. “But it was always important to me to not only be home but to be in the ‘hood, the neighborhood, hooping and playing in John Bailey’s Joint Effort basketball league. All the kids who had saw me on TV or knew me because their parents went to school with me or their uncles, all the kids that grew up hearing about the legend of what I used to do and what I did, now they could see me and be around in the neighborhood or center or sit on the bench with me during my games or see me at my camps. Before the 2016-17 season, Billups had a long motivational talk with Perkins that included adapting to his facilitator role and sacrificing. “Before he left to school, I brought him to the house and we sat and talked for two or three hours about what’s next and what he needs to do,” Billups said. “I’ve been talking to him all year long. I went to his game when they came to L.A. and played LMU [Loyola Marymount]. I watch his games and send him messages about what I see and what he needs to do. He’s been a great student and protégé. He listens and is coachable. Josh Perkins (No. 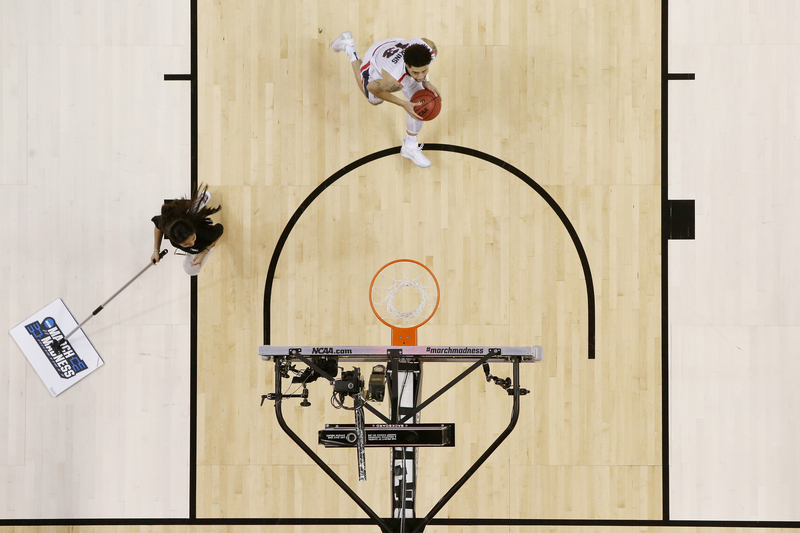 13) of the Gonzaga Bulldogs drives for a dunk as a court attendant cleans in the second half against the Xavier Musketeers during the 2017 NCAA men’s basketball tournament West Regional at SAP Center on March 25 in San Jose, California. “He means everything,” Perkins said about Billups. “He is a guy who saw a kid who was hungry and let me know. That’s a guy I call my big brother now, and he’s a person I can talk to about anything, not only basketball. He sends me texts before the games, and it means the world to have a person like that in my corner. Billups is known as “The King of Park Hill” and has it tattooed on his arm. Perkins says Billups “will always have that crown.” But in Park Hill on Monday night, all eyes will be on Perkins, beginning with that starting lineup shout-out. “Park Hill, stand up. Everybody is going to be rooting for him,” Billups said.